The most easiest way to cook some chicken thighs. I am a massive fan of spicy food and chillies. Its was almost like not cooking this meal as it has a very few steps. 2-4 TSP of vegetable oil. 1. In a non stick pan roast the cumin seeds, coriander seeds and cloves. This will help to temper the spices and release their flavours. Be careful not to burn the spices. Let the sees cool before you its added to the blender. If you have access to a pestle and mortar you can crush the seeds and chillies before mixing them with the yogurt. 2. In a blender mix all the spices with the yogurt. 4. 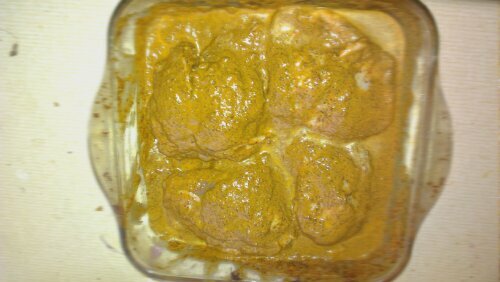 Pour the mixture over the chicken and marinate for 4 to 6 hours. 5. Heat the oven to 180 to 200 C, cook the chicken for 45mins to an hour. Serve with naan bread or would make great BBQ food. Would you try this for the Indian Summer Weekend? I have been diagnosed with eczema and every now and again it flares up with dry skin and itchyness which is very annoying. The other day, I was browsing the shelves of the library to get hold of a cookbook which would give me some inspiration to cook more dishes and update my blog more often. That’s when I came across a book called “The Clear Skin Cookbook by Dale Pinnock. The book is well written and quite detailed in terms of food that will help skin conditions and simple recipes to follow. After reading the book and since I have neglected certain foods which I enjoy a lot I decided to revisit them especially chickpeas. Apparently they are rich in Zinc which helps with skin lubrication and reduces sebaceous secretions. I have quite oily skin especially in summer and zinc reduces oily skin and helps to lock the moisture. 1/2 inch of cinnamon bark. Handful of spinach leaves or if using frozen make sure its defrosted. 1. Roast the cumin seeds, coriander seeds and the dry chillies. 2. Slice the onion and fry them till brown. 3. Blend the onion, cumin seeds, dried chillies, fresh chillies and coriander seeds along with the tomato puree and tomatoes. 4. Add a little oil to a pan break the cinnamon bark into small pieces fry them fgor about 15 seconds before adding thge contents of the blender along with 400g of chickpeas. Simmer for 30 mins till the chick peas are soft. 5. Add a handful of fresh spinach leaves. 6. Serve with rice or naan bread and some yougurt. Note: If you do not have cumin seeds, coriander seeds substitute them with the powder and instead of chillies use chilli powder. I would like to know if anyone makes chickpeas in a different way? 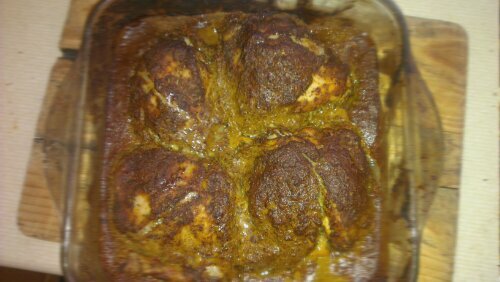 This Sunday I made some Tandoori Chicken after reading a receipe which was a bit different than the way I used to. 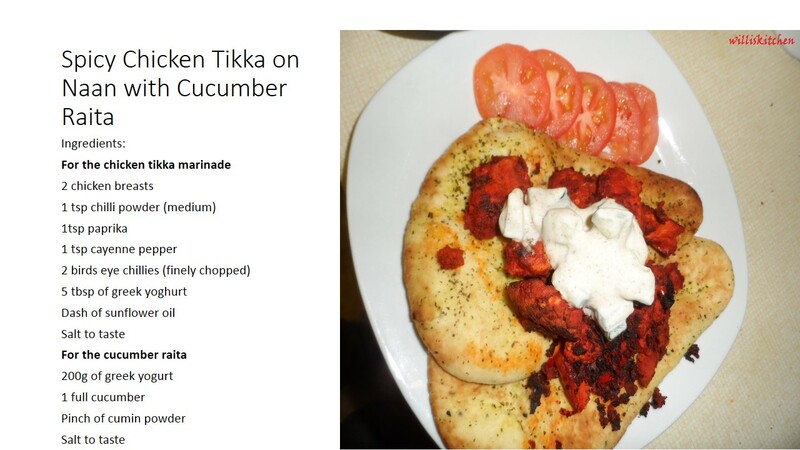 I normally would have made this by using ready made tandoori chicken powder. But I used ingredients totally from scratch. 1. Mix the yogurt with the spices preferably in a blender. If you do not have a blender mix the ingredients in a smooth paste. 2. Slit the chicken with 1/2 inch slits. 3. Marinate the chicken for 8 hours or overnight. 4. Pre-heat the oven to 180 C and cook the chicken pieces in there for about an hour till they are cooked. 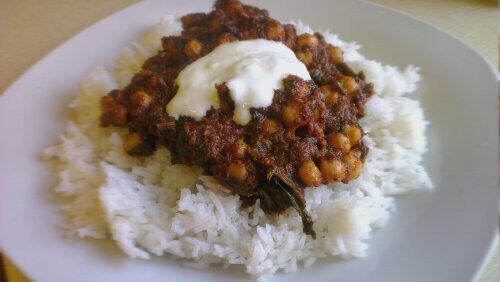 I recently made some chickpeas with some inspiration from allrecipes. I changed some of the steps to adapt to the slow cooker. The recipe called for using a tea bag and some bay leaves while boiling the chickpeas a step only to be used if you buy raw chickpeas that needs to be soaked overnight. I did use a tea bag but was a cheap one and not earl grey or english breakfast, you can avoid the step if you use tin chickpeas, just drain the liquid. The teabag seem to just have a tea colour stain on the chickpeas, maybe If I used Earl Grey or English Breakfast would be different. Heat a pan with olive or vegetable oil and fry the cumin seeds. Once they start to sizzle add the onion. Add the salt as it helps the onions fry quicker. Add the crushed garlic cloves to the onions. Once the onions are brown add the tomato purée and spices. Let the purée blend well for 5mins and let the mixture cool down. After it cools down add the mixture to a blender and blend for a couple of minutes. If you do not have a slow cooker add the mixture to the pan again, add the chickpeas bring it to the boil and simmer for about an hour. I added the blended mixture to the slow cooker along the chickpeas and let it cook on slow setting for 6 hours. 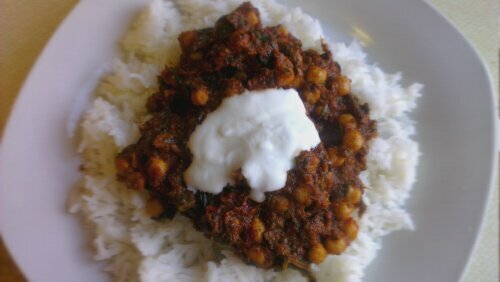 Serve with some basmati Rice or nan bread.